After a winter break that seemed as though it might never end, the return of Grey’s Anatomy is imminent. 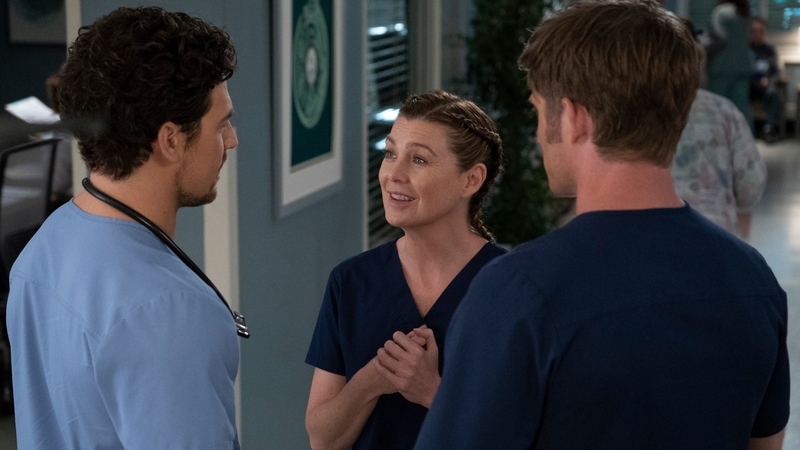 And thanks to new sneak-peek photos of the midseason premiere, we now know going into the episode that Dr. Meredith Grey’s love triangle isn’t going anywhere just yet. Last we saw Mer, she was caught in the kind of conundrum many of us only dream of — two handsome, charming, kind-hearted fellow doctors were vying for her attention. Fans know and have come to love Dr. Andrew DeLuca (Giacomo Gianniotti), who once dated Mer’s half-sister, Dr. Maggie Pierce (Kelly McCreary). The other suitor, Dr. Atticus “Link” Lincoln (Chris Carmack), is new and therefore lesser known but has made a solid impression so far. Earlier in the season, DeLuca professed his love for Mer, who didn’t really know what to do with the information at the time. Especially since her love coach, CeCe Colvin (Caroline Clay), had convinced her to go on a date with Link — to which Meredith shockingly agreed. However, at the end of the first half of the season, Meredith and DeLuca wound up stuck in an elevator together after an intense windstorm joggles Grey Sloan Memorial Hospital’s power. Which brings us to the photos ABC released ahead of season 15’s midseason premiere. It’s clear from the pics that Meredith and DeLuca do, in fact, make it out of the elevator. There are no photos to suggest the two do anything but talk in there, but they do look as though their relationship deepens in some way. Link is still there too, though, meaning Mer has a tough decision ahead of her. She clearly isn’t ready to make it just yet, because she appears to leave a perplexed-looking Link and DeLuca standing in the hallway as she walks away. And while it stands to reason that DeLuca has the upper hand at the moment, Vernoff revealed that there’s more screen time with Link yet to come. “In Episode 10, Meredith will get to know Link better. She gets to know DeLuca better in [the midseason premiere], and she gets to know Link better in 10,” said Vernoff. As for fan response to Meredith’s love triangle, most seem to be diehard #TeamDeLuca, aka MerLuca (raises hand). Deluca is not in kindergarten. Meredith and Deluca are perfect . But there are those who have suggested neither DeLuca nor Link are “mature” enough to be with Meredith, to which Vernoff has a pointed response. Grey’s Anatomy returns to TV with the season 15 midseason premiere on Jan. 17 at 8 p.m. on ABC.